World-famous Indian yogi and mystic Sadhguru (Jaggi Vasudev) will give a lecture for the first time at the Heydar Aliyev Center on November 10. The subject of his presentation is Inner Engineering: Technologies for Wellbeing. The subject includes techniques to accomplish harmony by bringing together human body, mind, senses, and energy to the culmination. No physical training or knowledge of yoga is required, and the techniques are easily adaptable to any lifestyle. The presentation elaborating on smart ways to manage human body, emotions, and inner energy will be followed by the Q&A session. The event will also present Sadhguru’s new book with copies signed by the author. One of India’s 50 most recognized personalities, Sadhguru is a yogi, mystic and a bestselling author dedicated to the improvement of human spiritual and physical condition. He was decorated with the Padma Vibhushan Indian National Award for his exceptional services. Insightful and logical presentations won Sadhguru the worldwide recognition as a speaker. With his precise and clear vision of existing problems on a global level along with specific approaches to improve human wellbeing, he was invited to speak at a number of international forums, including the UN Headquarters. He is a frequent presenter at the World Economic Forum, addressing a broad audience through TED conferences. Leading educational institutions inviting Sadhguru include Oxford, Stanford, Harvard and Yale Universities, Wharton Business School, University of Pennsylvania, Massachusetts Institute of Technology and other worldwide recognized institutions. In 1992, he founded the Isa International Foundation seeking to improve the global wellbeing. 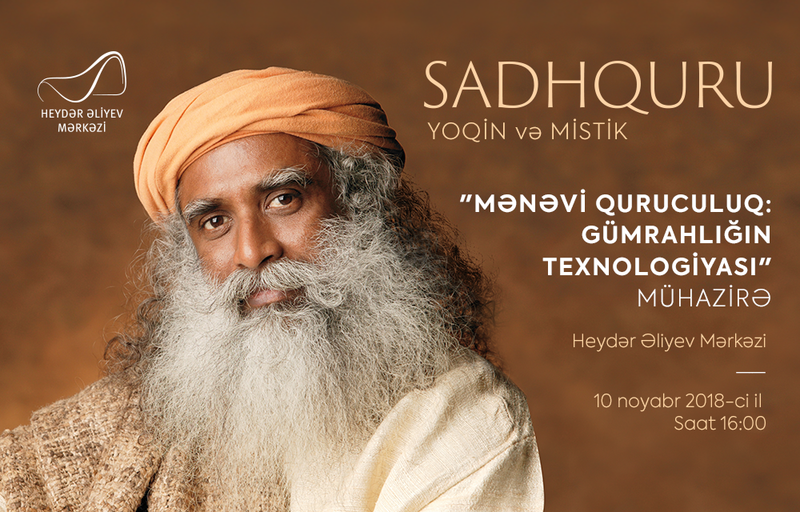 Tickets for Sadhguru’s presentation at the Heydar Aliyev Center are available at the Center’s Ticket Office, as well as through iTicket website. The price is 10-20 AZN ($5.8-$11.7), 50-100 AZN ($29-58). The presentation will be offered in English with simultaneous translation into Azerbaijani and Russian languages.